A bill working its way through the state Senate would require the state to share the financial burden it causes the next time it delays money due K-12 districts. Only a portion of the short-term interest charges that many districts face when forced to take out short-term loans would be reimbursed. But SB 1491 at least would recognize that billions of dollars in late payments can create an expensive cash crisis for districts, many of them in low-income areas. Within the past decade the state has used late payments, called deferrals, to help balance the budget. At this point, $10.4 billion – about 30 percent of state money owed to K-12 and community colleges – is budgeted in one fiscal year, but paid in the next year. Districts that cannot borrow internally, from their own accounts, have turned to county offices of education if available or to the open market, at interest rates from a few percentage points up to double-digit rates for some charter schools. Gov. Jerry Brown has made eliminating the state’s “wall of debt,” which includes deferrals, a priority for his proposed $9 billion tax increase, starting with repaying $1.8 billion this year. But if voters reject higher taxes, the state will face another year of big deficits, and another deferral to districts and community colleges would be an alternative to another outright cut. The pain of deferrals has not been spread equally, which has been a major source of contention by those who bear the bigger share. School districts’ basic funding under Proposition 98 consists of local property taxes and state revenue, with the state filling in whatever amount the property tax can’t meet. Deferrals affect only the state revenue portion, so districts with a low tax base and a high share of state revenue have been disproportionately hit by deferrals. Stephen Rhoads, a consultant who has done work on the issue for the sponsor, Sen. Gloria Negrete McLeod, has calculated, for example, that Fresno Unified currently has $2,005 per student in state aid deferred, while Huntington Union High School District in Orange County has only $526 per student deferred. Because of these disparities, Negrete McLeod proposed spreading the per-student cost of future deferrals equally among all districts, regardless of whether they’re property poor or rich, and having the state reimburse the full borrowing costs that they incur. Endorsing this concept, Bill Lucia, CEO of the nonprofit EdVoice, said deferrals have forced some districts to lay off teachers and cut programs. The inequitable distribution threatens to violate the Serrano case, in which the state Supreme Court demanded that the state fix inequities in school funding. Negrete McLeod’s bill initially suggested giving further breaks to districts with high rates of poor children. But staff of the Senate Education Committee found the deferral redistribution formula too complex and possibly unconstitutional, and recommended a simpler method with less cost to the state, which the Committee approved and Negrete McLeod accepted. Districts will be entitled to reimbursement at the interest rate that the state receives while pooling its revenue while waiting to fund various state budget accounts. That percentage is currently about 1 percent – far less than many districts are paying for short-term notes, but better than nothing. At a hearing last week on the bill, Lucia and Liz Guillen, an attorney with the nonprofit advocacy law firm Public Advocates, criticized this solution as not going far enough to address deferral inequities. It’s unclear how much districts will save or how the reimbursements would work. Details will be worked out as the bill goes through the Legislature, said Daniel Alvarez, staff director for the Senate Education Committee. Gov. Jerry Brown gave K-12 school districts significantly more money, tempered by conflicting messages and sober warnings in the revised budget he presented on Monday. Reflecting higher state revenues and an acknowledgment that schools and community colleges have been socked disproportionately in recent years, the extra dollars for 2011-12 would raise base level funding under Proposition 98 $3 billion above the $49.4 billion that Brown proposed five months ago. That’s about half of the $6.6 billion in new money that the state now expects (see budget summary for education). For most parents and teachers, the extra dollars will be all but invisible. Most districts won’t be rehiring staff or restoring programs from a few years ago; additional per-student aid will rise but a blip. Brown is proposing that nearly all of the money be used to eliminate $2 billion in late payments, known as deferrals, that he had proposed in January, and to pay down $400 million in previous K-12 deferrals, along with $350 million in community college deferrals. That will help districts’ balance sheets, but not the classroom, at least not directly. Funding overall would remain flat. Brown’s May budget also continues to assume that the Legislature will put on the ballot – and voters will soon approve – a five-year extension of the temporary increase in the sales tax, the vehicle license fee, and the personal income tax. 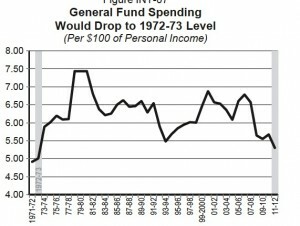 (The .25 percent income tax increase would be suspended this year but resume in 2012-13.) Tax extensions are critical to closing a budget shortfall that, even with higher revenues, remains at about $10 billion, Brown said. Though pressed by reporters, Brown and his finance director, Ana Matosantos, were vague – perhaps intentionally so since they are continuing to negotiate with Republicans on timing, length, and details of the taxes – in explaining how districts should go about building next year’s budgets now without knowing for sure there will be more revenue. He said he understood the school districts’ dilemma and indicated that there would have to be a transition in the event that the taxes were approved temporarily by the Legislature (four Republicans willing), then defeated by voters. But he did not elaborate. Even with taxes extended, spending for K-12 and community colleges next year would be $4 billion below the 2007-08 high water mark. 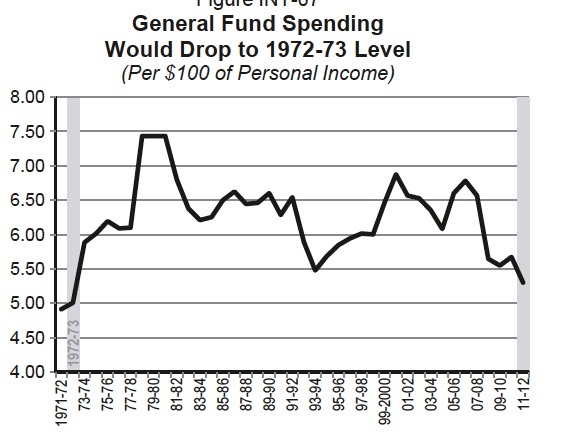 Even with tax extensions, state revenue as a percentage of personal income would fall to the 1972-73 levels (May Revision budget). Click to enlarge. The Education Coalition – the California Teachers Association, the state PTA, and the California School Boards Association (CSBA) – all separately praised Brown’s “balanced” approach to the budget. But consultants paid by districts to look into details were giving conflicting advice Monday. School Services of California Inc. was recommending to assume for the best: “Under the current circumstances, we advise following the Governor’s stridently delivered advice; if he is unable to deliver on his plan, the consequences will be laid at the Governor’s door.” But Bob Blattner of Bob Blattner & Associates was urging caution: “The Governor is essentially asking school leaders to jump out of an airplane, trusting that the backpack they are wearing contains a parachute.” Blattner was recommending that districts assume there may be as much as a $675 per student cut in state tuition, and then look for assurances from Sacramento that even if the tax extensions fail, there would be ways to soften the impact – like reinstating the deferrals. School districts handed out layoff notices to 20,000 teachers statewide. They became final on Sunday. If Brown’s May revise is adopted and taxes are extended, most of the teachers could be recalled. But districts worried that voters would say no to taxes would be wary of adding to their payrolls. Deferrals have grown dangerously large, to nearly $10 billion, putting dozens of districts in financial danger. As Bob Wells, executive director of the Association of California School Administrators, told us, the first deferral, moving payments back a day, from June 30 to the new fiscal year on July 1, seemed innocuous. But it quickly became a slippery slope, Wells said, with billions of dollars now deferred for 8 to 10 months. “I think for any family, if you looked at your June budget and said could you hang in there and get your money on July 1, sure; but if you woke up the next day and learned it would be months, then you’d be in trouble,” he said. Rick Pratt, vice president of CSBA, and Bill Lucia, president and CEO of EdVoice, agreed that erasing some of the deferrals was appropriate. Lucia said that deferring money owed to school districts, forcing them to borrow money, was using education to subsidize other parts of the state budget. “The governor has now made education a priority, and paying down deferrals is wise for education and wise budgeting,” Lucia said. Deferrals have had the biggest impact on small school districts and charter schools, which have had to borrow money at much higher rates than large districts, Lucia said. Property-wealthy districts that get a smaller portion of their money from the state for their base revenue were least affected, so reducing deferrals would begin to address that inequity in education funding and will ease cash flow problems, and even prevent some districts from being forced into insolvency, according to Nick Schweizer of the Department of Finance. To the extent that districts have to borrow less, they’ll be able to redirect savings to programs and personnel. What happened to the all-cuts budget? I and many others had assumed that Brown would lay out an all-cuts budget in detail – a Plan B – in the event that tax extensions are defeated. In his press conference, he would not be pinned down on the consequences. “I will not give Republicans a road map to ruin; I am giving them a road map to success,” he said. However, on page 12 of his budget summary, he wrote that community colleges and K-12 schools, comprising 40 percent of the general budget, “would need to bear a heavy share of an ‘all-cuts’ budget.” Proposition 98 would have to be suspended, he said. A cut of $5 billion to Prop 98 is the equivalent of lopping a month off of the school year and laying off 51,000 teachers, eliminating 52,000 courses at community colleges, and raising fees from $36 to $125 per credit. Brown has said he doesn’t favor using scare tactics to pressure voters to do the right thing. That may be one reason he didn’t lay out Plan B in detail. Another reason is that even an all-cuts budget would require four Republican votes – two in the Assembly and two in the Senate – and last week Republicans vowed not to suspend Prop 98. Brown said he was optimistic he could turn Republican votes; he said he was talking seriously with between four and 10 of them, without saying who. When to vote: Brown said he’d favor a popular vote as soon as this fall. But that would create problems for school districts; if he could persuade Republicans to extend taxes until a ballot vote next June or in November 2012 (what CTA favors), school districts could budget for a year without cuts. How long to extend taxes: Brown wants to extend taxes for five years. Could he persuade Republicans to agree to two or three? Price of reform: Business groups, including the Silicon Valley Leadership Group, the Bay Area Council, and the Los Angeles Chamber of Commerce, have written Brown calling for a “workout plan” pairing tax increases with structural changes in Sacramento: amending environmental regulations, adopting a spending cap, and scaling back public pensions. Brown said Monday he too favors annual limits on spending and pension reforms. Can he and Republicans reach a deal that doesn’t alienate Democrats? Proposed 2011-12 Prop 98 guarantee: May revise, $52.4 billion ($38 billion from General Fund); January budget, $49.4 billion. Increase: $3 billion. 2010-11 Prop 98 guarantee, as adopted: $49.7 billion. 2011-12 Prop 98 guarantee without tax extensions: $50.8 billion. Increase over 2010-11: $1.1 billion. Proposed 2011-12 K-12 per-pupil funding: $7,878; January budget as amended by the Legislature, $7,693. New proposed increase: $185 per student, 2.4 percent.